House of Thai uses their own specialised couriers to deliver their food. Veggies vermicelli wrapped in crispy pastry served with sweet plum sauce. Puff pastry filled with chicken and potato served with sweet and sour sauce. Chicken, veggies, water chesnuts wrapped in crispy pastry served with sweet chilli sauce. Spicy Thai fish cakes deep fried and served with sweet chilli sauce. Spring roll, curry puff, money bag and fish cake served sweet chilli sauce. Grilled marinated chicken breast skewer with satay sauce. Mince pork veggies and soy sauce. Crispy fried soft shell crab served with sweet chilli sauce. Medium hot authentic curry paste based with coconut milk, vegetables and basil. Mild authentic curry paste based with coconut milk, vegetables and basil. Thick curry cooked in coconut milk, vegetables and peanut sauce. A sensation homemade spicy curry "Without coconut milk" cooked with vegetables and Thai herbs. Slow cooked beef in mild curry with coconut milk potato, onion and garnished with crushed peanuts. Sliced chicken or beef then grilled meat seasoned with chilli jam dressing and salad. Warm salad of minced chicken with Thai dressing, ground roasted rice, Spanish onion, mint and coriander. Deep fried soft crab with chilli lemon dressing, mint, coriander, tomato and Spanish onion, salad. Prawns or seafood with chilli lemon dressing, mint, coriander, lemongrass, and Spanish onion. Served with tomato, mint, coriander, cucumber, shallots and drizzled with chilli jam. Wonton soup with veggies and clear soup. Spicy hot and sour soup with Thai herbs. Medium spicy soup with coconut milk with Thai herbs. Stir fried crispy pork with special curry paste, vegetable, kaffir lime leaves. Stir fried beef with butter,cheese oyster sauce, and vegetable. Mixed seafood stir fried in curry powder, celery, chilli jam and egg in a distinctive Thai sauce. 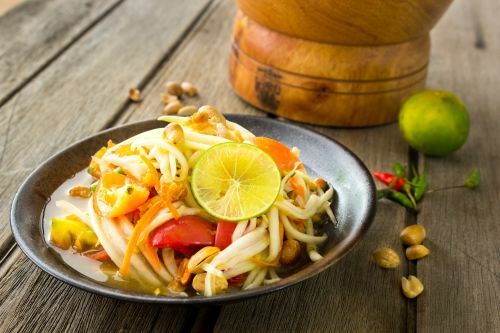 Banana flower chopped finely and seasoned with an exotic blend of spices and peanut topped with chicken or prawn and drizzled with coconut milk. Grilled salmon fillet with chilli jam dressing,mint, coriander,cucumber,tomato and Spanish onion. Grilled salmon fillet served with home made creamy sauce and steamed vegetable. Grilled salmon fillet with curry sauce (Green curry or red curry or panang Curry)steamed vegetable. Deep fried fish or prawn with homemade sweet chili sauce fresh ginger ,cashew,peanuts,lime and fresh herbs. Stir fried snow pea with oyster sauce and vegetable. Deep fried fish or prawn with steam vegetables topped with tamarind sauce and fried onion. Deep fried whole snapper with choice. Stir fried chilli jam sauce, vegetables and cashew nut. Stir fried fresh chilli, basil leaves, garlic and vegetables. Stir fried vegetables with oyster sauce. Stir fried with vegetables, garlic and pepper. Stir fried fresh ginger with vegetables. Stir fried with vegetables and satay sauce. Stir fried Chinese broccoli, oyster sauce, chilli and garlic. Stir fried spicy homemade chilli paste with green peppercorn, kaffir lime leaves, and vegetables. Thai style sweet and sour with carrot, pineapple, tomato, onion. The thin rice noodle with egg, bean sprouts, tofu, crushed peanut. Flat rice noodles with black soy sauce, egg and vegetables. Stir fried flat rice noodles with fresh chilli, basil and mixed vegetables. Hokkien noodles stir fried with vegetables, topped with satay sauce. Stir fried flat rice noodles with chilli jam sauce, vegetables and cashew nut. Stir fried Hokkien with mixed vegetables and homemade sauce. Stir fried thin rice vermicelli noodle with curry powder vegetables, egg and bean sprout. Stir fried Spaghetti noodles with fresh chilli, basil and mixed vegetables. Fried rice with tomato, onion, baby corn, and egg. Fried rice with fresh chilli, basil, onion, baby corn and egg. Fried rice with Thai traditional tom yum flavors, onion and coriander.